Forty thousand children were in Toronto's Sky- dome September 25 to welcome Nelson Mandela, President of South Africa. 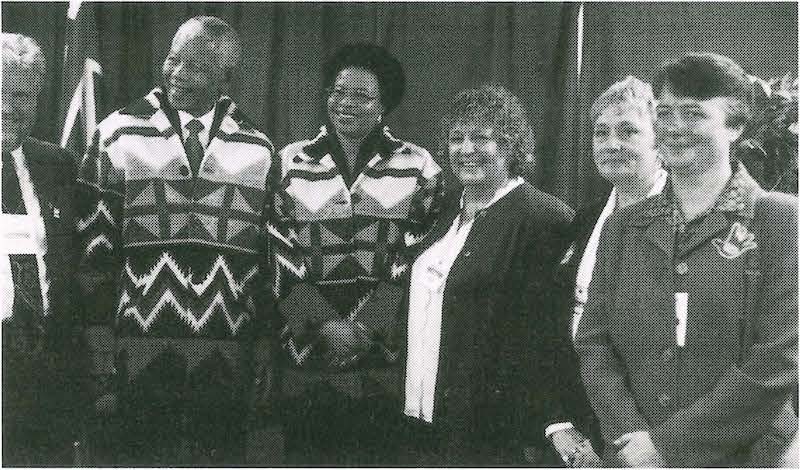 Mandela was in Toronto to participate in the first major event sponsored by the Canadian Friends of the Nelson Mandela Children's Fund. inform the public of the social, economic and educational hardship experienced by disadvantaged children and youth in South Africa. The Ontario Teachers' Federation (OTF); the Elementary Teachers' Federation of Ontario (ETFO); the Ontario Secondary School Teachers' Federation (OSSTF); and the Ontario English Catholic Teachers' Association (OECTA) were among the major sponsors of the September 25 event, which was designed to launch the fund and raise awareness about the organization and its objectives in Canada. "In 1988,1 visited Sierra Leone, West Africa, as part of CTF's Project Overseas and was overwhelmed by the hardship I saw all around me," Delaney says. "When I got back to Ontario, I talked with the Student Council about the experience and we decided to send some basic school supplies, such as ball point pens, used erasers, pencils, etc. to a school in Sierra Leone. "The response amazed us all. The Port Loko school gave these supplies out as prizes. One of our ball point pens, for example, was presented to the student who did best in geography. Next year, we sent more supplies. "Over the years, our Sierra Leone Project has evolved. The approximately $10,000 we've raised to date has helped to build a well and fight cholera. We are now supporting an orphanage. We've also been affected by the tragedy of Civil War in Sierra Leone. Twenty-two students from Port Loco were kidnaped by rebels; one was burned alive. "Our main fund-raising event is the publication of an annual calendar. The students in Port Loko send pictures and submissions; Victoria Harbour students add theiown submissions. We then publish and sell the calendar. "Early this summer, I was asked for the names of five students to represent the school at a monster rally for Nelson Mandela in Toronto. This request recognized our close ties with Sierra Leone. To cut a long story short, with OTF's help, we managed to get six tickets in the Rally's VIP section, immediately behind the Prime Minister and the Lieutenant Governor. "We set off from Victoria Harbour at 4:00 a.m. on September 25, drove to Newmarket and took the GO bus to the subway. By the time we arrived at Union Station, thousands of others were heading for the same event. In spite of the crowds, we got to our seats just after 10:00 a.m Within seconds, we were joined by Phyllis Benedict, President of ETFO, with whom I had been on Project Overseas in India. Three rows ahead of us was Toronto Mayor Mel Lastman. One of our students had a video camera. She was backstage filming when Mandela arrived and was thrilled to shake hands with him. "One of the most astounding moments was the prolonged booing for Premier Mike Harris. None of us joined in. We looked at each other in astonishment. We felt it must have been very embarrassing for the South Africans and other foreign guests. "When the program finished and the Mandelas had left for the Sheraton Hotel, we wandered around, waiting for the crowd to disperse. We were speaking with the former Lieutenant Governor, Lincoln Alexander, who had heard about Victoria Harbour Elementary School and our Sierra Leone project, when one of our students rushed up to tell us the Lieutenant Governor, Hilary Weston, wanted to meet us. This was another highlight for us and an opportunity to clear up a misunderstanding about her previously scheduled, but subsequently canceled, visit to Victoria Harbour. "Leaving the Skydome, we walked to the Sheraton and found Mr. Mandela would not reappear publicly until his departure. We were still hoping to present him with a Hawk- ster (a small replica of our school's mascot) as well as our Sierra Leone calendar. "After lunch, we walked to the Legislature and met several of the Lieutenant Governor's staff, who gave us a tour of the Vice-Regal suite. We also visited the Legislative Chamber and saw the Premier's (empty) office. On our way to the Royal Ontario Museum, we bumped into Susan Swan, a well-known author and poet who grew up in Midland. As we left the ROM to return to the Sheraton, we heard there had been an earthquake that afternoon, and that Mr. Mandela had become ill.
"The Sheraton was crawling with media, tourists and police. No one seemed to know where the Mandelas were, when they would be leaving, or from where. Security, crowds and media were at all four exits. We managed to be very close when the Mandelas left for the State Banquet at the Royal York Hotel, but not close enough to make our presentation. We were a bit disappointed, but it had been fun. It was time to go home. "We walked down Bay Street, heading for the Union Station. At Front Street, we could see police everywhere. When we got to the Royal York Hotel, we discovered that, because of his illness, Mr. Mandela would be at the banquet for only few minutes and would be leaving almost immediately. So it was that we were on the spot when the Mandelas left the Royal York with Canada's Prime Minister. The friendly crowd made room for us and called the Mandelas over. We were able to present our Hawkster and our Calendar. Our day was complete. "Mr. and Mrs. Mandela came to Canada with the express wish of meeting Canadian children. On the memorable day, they met more than 40,000 children at the Sky- dome. The last children they met, however, were those proud young Canadians from Victoria Harbour Elementary School who care so much about Africa and who now have met one of the greatest African heroes of all time. Somehow, it just seemed right." Paul Delaney teaches grade four at Victoria Harbour Elementary School, Simcoe County On September 25, 1998 he was accompanied to Nelson Mandela and the Children by Brianne Nigro, Darren Simpell, Curtis Hoddy, Luke Edwards, Kyle Graham. All the students are members of the school’s Foreign Affairs Committee. If you would like to help students in West Africa by buying this year’s Sierra Leone Calendar, the school can be reached at (705) 534-3101.